When I was in college, t-shirt bedding was popular. There were t-shirt sheets and t-shirt pillowcases. And one day, I saw that someone had a t-shirt quilt. Now, the quilt was different from the bedding and pillowcases, which were simply made out of stretchy t-shirt material. The quilts were actually made out of squares one’s old t-shirts. And friends, I had a lot of t-shirts. I had t-shirts from youth rallies and camps, from tennis tournaments and high school events, from Lipscomb organizations and trips. And I loved them all, not because I loved t-shirts, but because of the memories each represented. To me, these t-shirts were symbolic representations of very important, shaping events in my life. I had way too many of them to wear, but I just couldn’t throw them away because of their emotional value. I needed one of those t-shirt quilts. And I knew just the person who could make me one: my mom. 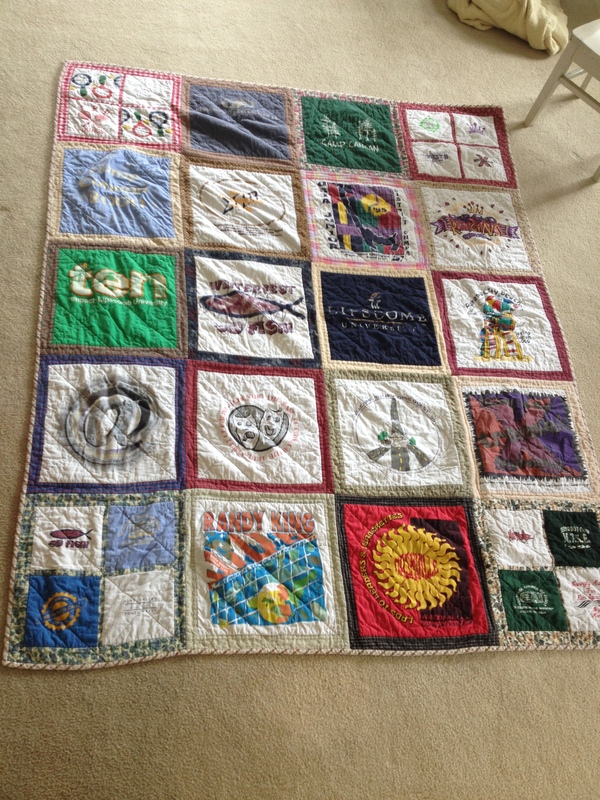 It never occurred to me that my mom couldn’t make a t-shirt quilt, even though I’d never known her to make a patchwork quilt and even though I was fuzzy on the details of what t-shirt quilts actually were. My mom could make anything with her hands. This is knew. It was immutable fact, as sure as her love for me. I also knew that she would make me one if I asked. Again, this was not guesswork for me. So I called her and asked. I described what it was as best I could. And of course, she never hesitated in accepting the challenge. Even though she had never heard of a t-shirt quilt or knew what one even was supposed to look like, she agreed to make one. See, a funny thing has happened with my t-shirt quilt. Now, when I look at it, I can’t remember any specific details about any of those events. How did I do in the Randy King Memorial tournament? I couldn’t tell you, other than to say I’m pretty sure I got my clock cleaned. What happened at the ’93 Lads to Leaders/Leaderettes convention? How am I supposed to know?? I was thirteen years old! That was ages ago! And those Winterfests? Those Camp Canaans? Those Impacts and Youth in Actions? I really have almost no memory of them, except that I think I had a good time at most of them. Fifteen years later, I could not tell you a thing about these “formative,” “shaping” events. But you know what? Even though I can’t remember anything specific about the t-shirts, I love this quilt even more now than I did when I first got it. Because my mom made it. This was her first patchwork quilt. She’s gone on to make dozens of t-shirt quilts for high school graduates. And beautiful baby quilts for new moms. And countless other quilts that she has given away to people she loves or people who are in need of some love. She’s entered quilts in the fair and won many awards. I have her first blue ribbon quilt on my bed, and in the winter, it lays on top of her first “People’s Choice Award” quilt. My kids have quilts made by her. We all have Christmas quilts. And I love them all not just because they are all exquisitely beautiful, although they are (you can call me biased, but you could hardly call the judges at the fair biased, not to mention the quilt-voting-populace of middle Georgia). I love them because they were made by the woman I love most in this world. Especially that first quilt. Because fifteen years later, I can look at it and realize that what formed me most were not the church events I went to or the camps I went to or even the college I went to. Instead, it was the woman who both literally and figuratively knitted all those things together in my life. She was the formative, shaping influence (she and my dad, of course). In fifteen years, all those detailed memories have fallen away–or rather, they have been distilled into what was actually important. Now, when I look back at my high school years, I don’t remember all those little events I attended. Instead, I remember my parents’ presence. And their love. And their influence on me. I just finished a book called Hold On To Your Kids. It is all about how for about the past fifty years, the generations of youth have become increasingly more “peer-oriented,” instead of “adult-oriented.” That means they view their peers as their “compass points,” their chief, guiding force in life. You can read the book for all the details, but basically, the authors make a really compelling case that this is a bad thing. Kids simply aren’t equipped to be each other’s compass points. That job belongs to adults. And when kids do it, it leads to a world of trouble, both individually and on a societal level. Reading the book, I realized that my parents were really, really good at establishing themselves as our compass points. And they did it in just the way the book suggested: by nurturing very close and loving relationships with my brother and me. And that’s what molded me into the person I am. I still look at my t-shirt quilt as a representation of what formed and shaped me…but it’s no longer because of the events in the squares. It’s because I had someone in my life who loved me enough to make it for me. I hope my kids see me and my wife the way you describe your parents, Kim. This post is a lovely tribute to them (and very timely for Mother’s day, too! ).